The solution is simple in Windows 8.1 and 10 to see, add or remove allowed programs to communicate through Firewall? An overview of Programs and Features approved through the firewall , you can see via the Windows 8.1 Control Panel and a click on the Firewall Icon. In Windows Firewall click the text "Allow an app or feature through Windows Firewall". After that, you can see the list of allowed programs! Press the Change Settings to add additional programs or remove existing! 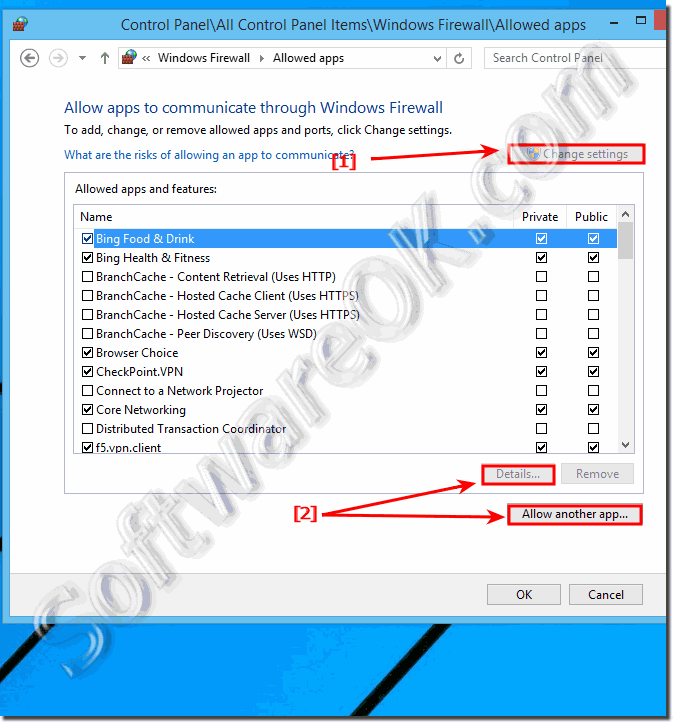 (Image-1) Allow an app or feature through Windows Firewall in Windows 8.1! Important Info from (c) Microsoft! When you add an app to the list of allowed apps in a firewall—sometimes called unblocking—or when you open a firewall port, you allow a specific app to send info to or from your PC through the firewall, as though you drilled a hole in the firewall. This makes your PC less secure and might create opportunities for hackers or malware to use one of those openings to get to your files or use your PC to spread malware to other PCs. A port stays open until you close it, but an allowed app opens the "hole" only when needed. Generally, it's safer to add an app to the list of allowed apps than to open a port. Windows-8 - FAQ-160: Where can I find in Windows 8.1 and 10 allowed programs to communicate through Firewall? How to change firewall setting for app in window 8.1 or 10? What apps do i alliw communicate thru window firewall? Autoriser programs win 8.1 or 10? How to open firewall port in windows 8.1? Windows 8.1 / 10 allow program through firewall? In windows 8 where can i find allowed apps and features? List of accepted apps windows firewall\? Win 8.1 or 10 delete firewall allowed app? Windows firewall list of applications? Where can i find firewall in window 8.1? Win 8.1 and win 7 communicate? Open in windows 8.1 the firewall settings, how to? Find list of programs on windows 8.1? Allow apps through firewall win8.1? Firewall settings for windows 8.1 apps? How do you add to your firewall? windows 8.1? How to approve programs in microsoft firewall, win 8.1? Adding pay pal to firewall programs? Windows 8.1 firewall list of applications? How to get windows 8 firewall settings? How to open firewall settings in windows 8.1? Can you buy windows 8.1? Allow windows store through firewall? Windows 8 list of allowed programs? How to firewall program on windows 8.1? Allow a program through Windows* Firewall windows 8.1? Win 10 firewall add list?